I am winding down to the finish of the Diva collection!! There are more Diva's but after my next one I will be done for awhile because I am ready to move on to something else for now. I thought they Diva in the throne was adorable and I was going to use a Stampin Up! sentiment I have but I decided to go with the "Queen 4 a day" from the Once Upon a Princess cartridge. I also saw this cute little flower on the cart and thought it would make a nice little embellishment. I had a hard time going with colors for this one since there were so many bright *okie thinks almost neon* colors and I was afraid if I matched the colors too close it would blind me just looking at it. I was able to find some double sided Stampin Up! that I thought worked well. And it does work better in person. 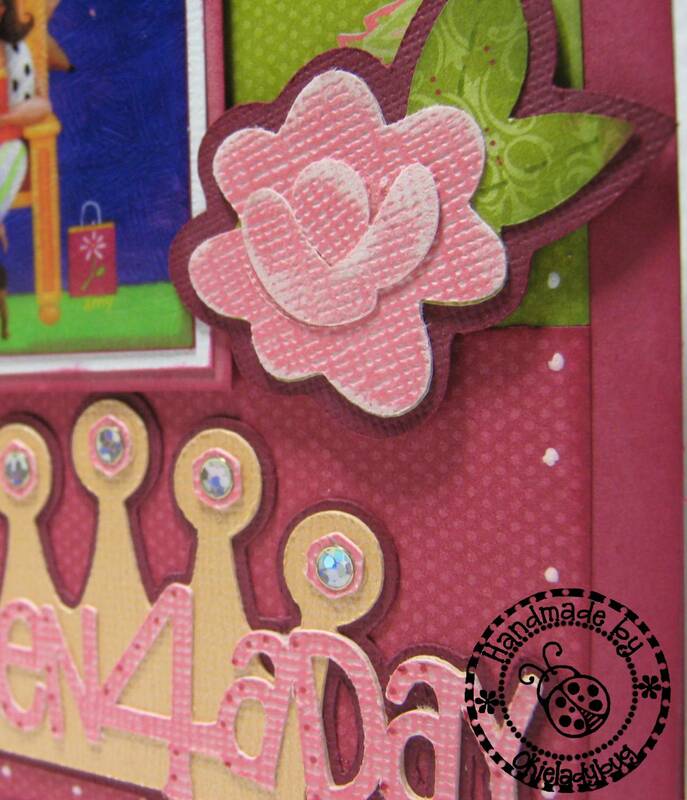 The image and flower are pop dotted, the sentiment is adhered directly on the card. I used some Coredinations Vintage for the flower and sentiment phrase. The sanding on the flower added enough dimension that I didn't need to do any inking. I actually did the sanding after the flower was put together. It made it easier to do than trying to hold the little pieces while sanding. I just laid the flower flat on the table to sand the middle and then held up the flower to do the edges. Sanding was done before the flower was adhered to the shadow layer. I did ink the leaves of the flowers a little. On the crown I used some Bazzil Bling paper and added some Stampendous stickers for jewels. I am off to finish the last of the Diva's!! Wish me luck!! The cards is amazing, so very pretty and I love Coredinations cs too. It cuts so nice. The graphics made me laugh so hard...so cute too. TFS! I like the queen image! Yours print out so much better than mine! I need another photo editor class! LOL! Another winner and fun card. Good luck! Your work is amazing! Good luck on yor next card...........not that you need it! 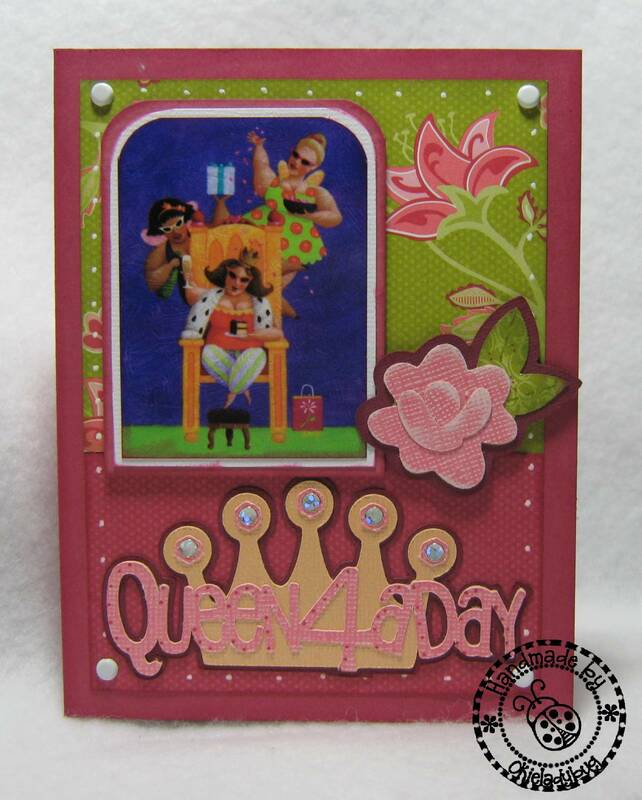 I'm queen for the day today, it is my birthday! I love this card, the colors are so pretty. Good luck on the last of the queens!